The race number you receive at packet pickup will be stapled together. The smallest number is the helmet number, the middle sized number is you run number, and the long piece is your number for your bike. While you have this number in print form you will also be receiving body marking on race morning. The helmet number is the small piece of paper on the front of the race number. This piece of paper is actually a sticker. You will need to peel the sticker off of its protective paper and place it on the front of your helmet. Placing the number on the side of the helmet will make it harder for the USAT Officials, photographers, volunteers and race staff to identify you quickly so please be sure that you place the sticker on the front. See picture below for detail. The bike number is the largest piece of paper and is located in the back of your race number grouping. You will notice the the number is upside down at one end and right side up at the other. The reason for this print orientation is so that when the number is folded over the top tube of you bike your race number can be read easily from either side. There are two adhesive strips on the backside of the bike number. You will peel the protective paper off of the adhesive strips and then place the number on the top tube of your bike as illustrated in the picture below. The run number is the middle sized paper in you race number grouping. You will need to wear this number on the run course. This number MUST be on the front of you as you cross the finish line. Not having the run number on the front of you may results in a time penalty. You may use saftey pins (provided at packet pick-up or chip pick-up) or a race belt to display your on your front. On race morning after you have affixed your assigned race number to your helmet, bike, and shirt/race belt you will then need to get your body marking done. The body marking station is located near the entrance to the Transition Area at the race site. Plan to bring your run number with you as you will to insure that the person body marking you is writing the correct number. The body marking will have your assigned race number on both your upper right and upper left arms, as well as on both you right and left thigh. 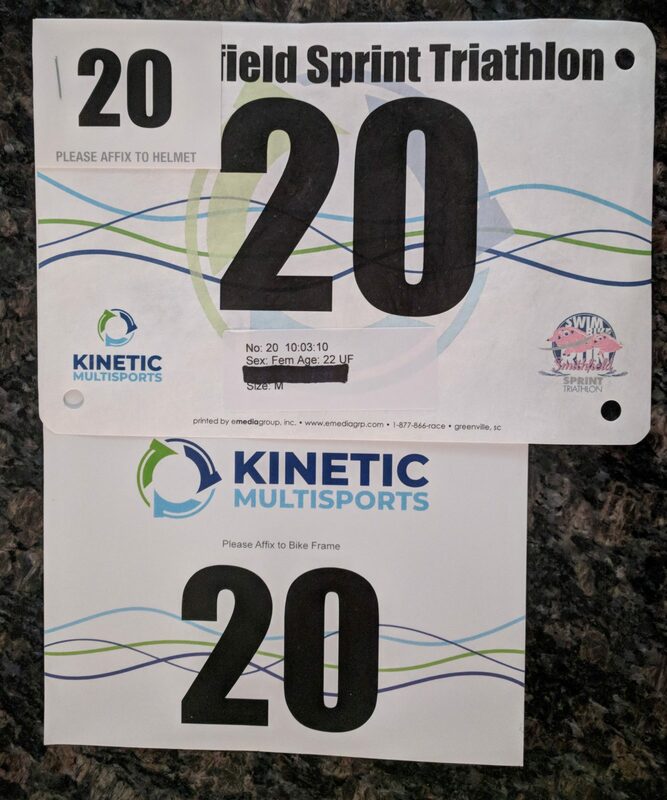 You will also be marked on the back of you left calf with your age if you are racing in the Age Group division or with you race division if you are racing as a Novice, Clydesdale, Athena, Aquabike, Military, or Relay.